This centre offers a wide range of offices, each benefiting from secure underground parking, a videoconferencing studio and an on-site lunch restaurant that also provides its own sandwich service. Located within The Hague's Beatrixkwartier business district, this centre profits from being positioned over the main entry to the A12 motorway. Within walking distance, there is a great selection of hotels, restaurants and public interest spots, such as the Literary Museum. This modern workspace is located in the heart of The Hague, across from the city hall. With excellent public transport links the building is known as the Ice Palace due to its colour and beautiful design. There is also on-site administrative and IT support, in addition to a management team with multi-lingual staff. With videoconferencing facilities, you can convene global meetings from this attractive space with ease. A sharp, contemporary building which benefits from being directly above de Randstad transport hub and has furnished offices and meeting rooms available with a host of facilities. These include a business lounge, an in-house restaurant and ample car parking space. The Hague is a popular business address for multinationals and has a vibrant culture with many museums, cafés and bars. Across the road, there is a park where you can relax during your well deserved breaks! Housed in the 'Haagsche Hof' building, this centre combines classic 19th century style with all the comforts and facilities of a modern office complex. The building is well located in the centre of The Hague and its governmental district, benefiting from nearby transport links including the central station and Dutch motorway system, secure underground parking, a videoconferencing studio and a lounge area. 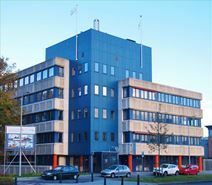 This is a unique business centre, easily accessible via the A4 motorway. Offering fully furnished office space with a minimum contract of 3 months, you do not have to worry about long-term commitments with flexible terms. A full range of facilities is available, including meeting space and virtual offices. Parking around the building is free and there is ample parking on site for your convenience. Right in the heart of The Hague's international business district, this fully serviced office space is housed within an iconic building that is easily accessible by both car and public transport. The ground floor of this centre has been undergoing a grand and luxurious upgrade. You can make use of the new indoor gym and the business lounge with a roof terrace. Furthermore you can have a good start of your day with a delicious cup of your favorite coffee at ‘Brasserie De Haagsche Zwaan’! This centre provides inspiring offices and workplaces for the enterprising business professional. It is accessible 24/7 and offers meeting rooms as well as versatile work stations. It is suitable for a range of business types, this centre offers an elegant, stylish environment. Located in a historic building in the heart of the Hague, close to many shops, restaurants, hotels and great transport links.